The adsorption properties of alfalfa biochar, which is produced via high-temperature pyrolysis for 3 h, were improved by activating it with acid pickling and reheating for 2 h (named AB). The alfalfa biochar prepared under various conditions, such as ultrapure water washing (named AWB3), acid pickling (named APB3) without reheating and cracking, and pyrolyzing of alfalfa for 5 h before ultrapure water washing (named AWB5) or acid pickling (named APB5), were used as controls. The adsorption capacity of biochars was detected by using p-nitrophenol (PNP) as a model pollutant. The corresponding results showed that the specific surface area (SSA) of AB (119.99 m2 g−1) was substantially higher than those of AWB3 (0.030 m2 g−1), APB3 (2.58 m2 g−1), AWB5 (0.46 m2 g−1), and APB5 (2.10 m2 g−1). The enhancement was primarily a result of the following factor: acid pickling and reheating could effectively remove mineral salts and tars, respectively, thereby opening the inner pores. The removal efficiency for PNP was enhanced from 4.43% (AWB3) and 10.68% (APB3) to 98.35% (AB); further, the adsorption equilibrium data of AB followed the type II Langmuir isotherm well, with a high linear-regression value (R2 = 0.997), low chi-square statistic (χ2 = 0.0009), and RMSE (0.0031). X-ray photoelectron spectroscopy (XPS) and Fourier transform infrared spectroscopy (FTIR) determination confirmed that hydrogen bonds and π–π EDA interactions participated in the adsorption process. • Two-stage activation increased the specific surface area and pore volume of biochar. • Acid pickling and reheating removed mineral salts and tars on the biochar surface. • Activated biochar removed over 98% p-nitrophenol from aqueous solution. • The oxygen-containing groups participated in the adsorption process of PNP. The online version of this article ( https://doi.org/10.1007/s11356-019-04862-3) contains supplementary material, which is available to authorized users. 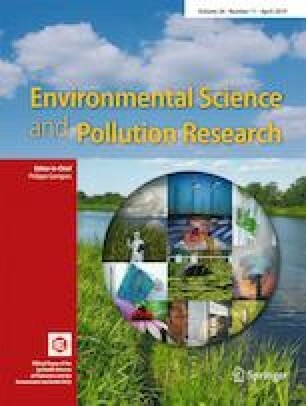 Further, the authors would like to thank the state-local joint engineering lab for control and remediation technologies of petrochemical contaminated sites at Jilin University, China for providing us with experimental resources. This work was supported by the National Natural Science Foundation (Grant Nos. 41372236 and 41572217) and the 111 Project (Grant No. B16020) of China.